Everyday Black, White, Brown, Red, and Yellow people in the U.S. and throughout Mother Earth are under intense attack by a national and global power elite whose objective is to propagate ignorance and fear in order to economically, politically, and socially keep ordinary people in a state of lethargy and submission. It has been said, “It is only totalitarian governments that suppress facts. In this country we simply take a 'democratic' decision not to publish them.” Translation: Keep the ordinary people ignorant and malleable, thereby keeping the people in a perpetual state of manipulated disarray and fear. The horror of U.S. corporate/government war mongering and perpetual wars & military 'police' actions abroad, combined with increasing austerity, a de facto police state, corporate hegemony, non-transparency, interminable government subterfuge, and incessant corporate-stream media disinformation at home in this year of 2013, under the Obama / Biden regime (and their Democrat and Republican accomplices) is the staggering reality of the present. The bitter irony of this is that by not acknowledging and addressing these staggering realities, the economic, social, and political pain and systemic servitude of everyday ordinary Black, White, Brown, Red, and Yellow people are immeasurably exacerbated. And as the pain increases, the corporate-owned government and corporate-stream media provide scapegoats – when in fact it is the internal and external polices of this corporate government itself that are directly responsible for the pain of the people – which is being mercilessly pimped. Fortunately, some in this nation are increasingly awakening. However, a disproportionate number of everyday people remain enslaved to the novocaine-type mindlessness and insidious propaganda of and by a U.S. government and media intent upon anesthetizing critical thought. It is a deliberately induced form of denial and slavery on a scale never before carried out against the people of this nation and world. The terrible pain being heaped upon the people of this nation and world by Mr. 'Kill List' - drone man - Barack Obama and his minions, can only be sustained as long as the masses of everyday Black, White, Brown, Red, and Yellow people are kept ignorant, uninformed, and/or misinformed. 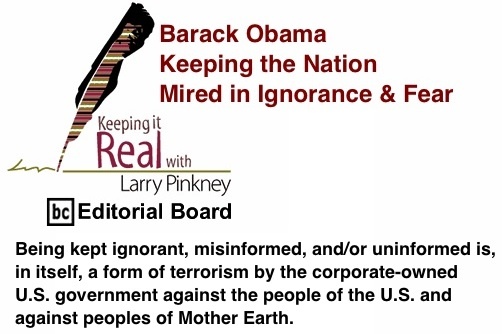 Being kept ignorant, misinformed, and/or uninformed is, in itself, a form of terrorism by the corporate-owned U.S. government against the people of the U.S. and against peoples of Mother Earth. In the words of Rosa Luxemburg, “The most revolutionary thing one can do is always to proclaim loudly what is happening.” Our task is to consistently and persistently awaken our sisters and brothers to their peril and to from where that peril is emanating. Political, economic, and social justice is today, in the insightful words of Frederick Douglass, being “denied,” even as “poverty,” in real terms, is “being enforced,” and manipulated “ignorance” and disinformation “prevails.” None of this is by mere coincidence. This is all by design on the part of the amoral, blood sucking power national and global elite. But this situation, though perilous for everyday people, is far from being hopeless. There is absolutely no reason to accept perpetual U.S. wars abroad. There is absolutely no reason to accept a police state and economic austerity at home. Moreover, there is no reason that we should accept the continued imprisonment and the brutality of the many U.S. political prisoners of all colors being held in the obscene prison gulags throughout this nation, not to mention Guantanamo! Be all that you can be. Be human again! Be a critical thinker and doer - for the sake of yourselves, people everywhere, and for Mother Earth herself! This insanity must cease. Turn off your television sets and turn on your minds! Barack Obama and his corporate-owned Democrat and Republican minions can keep this nation mired in ignorance and fear only if, we the people, allow them to do so. Remember: Being kept ignorant and misinformed is a suppression of human rights and is, in itself, a form of terrorism, which in turn, breeds even more terrorism. It must not be accepted! So get busy! Each one, reach one. Each one, teach one. Onward, then, my sisters and brothers. Onward...! BlackCommentator.com Editorial Board member and Columnist, Larry Pinkney, is a veteran of the Black Panther Party, the former Minister of Interior of the Republic of New Africa, a former political prisoner and the only American to have successfully self-authored his civil / political rights case to the United Nations under the International Covenant on Civil and Political Rights. In connection with his political organizing activities in opposition to voter suppression, etc., Pinkney was interviewed in 1988 on the nationally televised PBS News Hour, formerly known as The MacNeil / Lehrer News Hour. For more about Larry Pinkney see the book, Saying No to Power: Autobiography of a 20th Century Activist and Thinker, by William Mandel [Introduction by Howard Zinn]. (Click here to read excerpts from the book.) Click here to view Larry’s interview of October 26, 2012. Click here to contact Mr. Pinkney.